If you’re like me and have read a LOT of manga, chances are you can’t always find new, interesting stuff with ease. You’ve read most everything on the “top” or “HOT 100!” lists, and there aren’t always good resources for finding more. In those cases, this is one of my favorite methods with which to find hidden gems that I’ve never even heard of, but are great nonetheless. 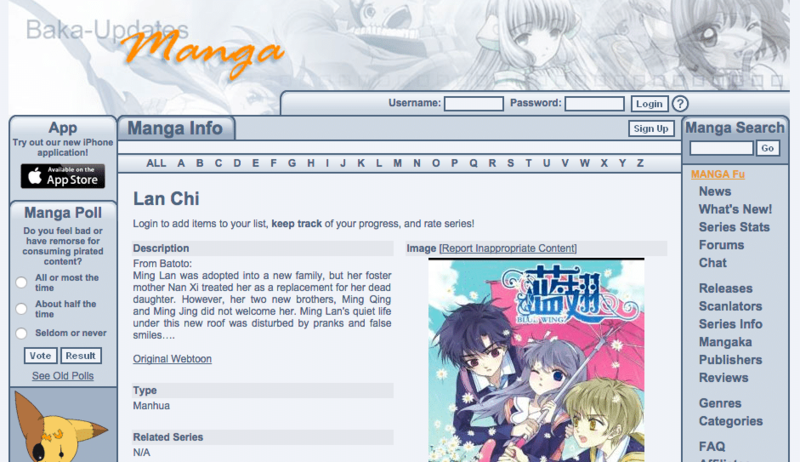 First, go on to Baka-Updates and look up a series that you personally find excellent. Preferably not something too mainstream like Naruto or Bleach. This method works best when you’ve already discovered something less well-known which you love, and are seeking more. Second, scroll down to the reviews section and read the reviews. Ideally there aren’t more than 4-5 pages of reviews. If you see 20 pages worth of reviews, you’re probably better off trying another series. Find some reviews that match your opinion of the series. Note that this works both for series you love and ones that you liked but thought were not so great! If you loved it, and another reviewer said pretty much the same thing, or if you thought it had some flaws, and another reviewer pointed out similar flaws, note them down. This doesn’t have to be exact, but filter out reviews that are totally opposite from what you thought of the series (e.g. you loved it but the reviewer gave it a 1/10). 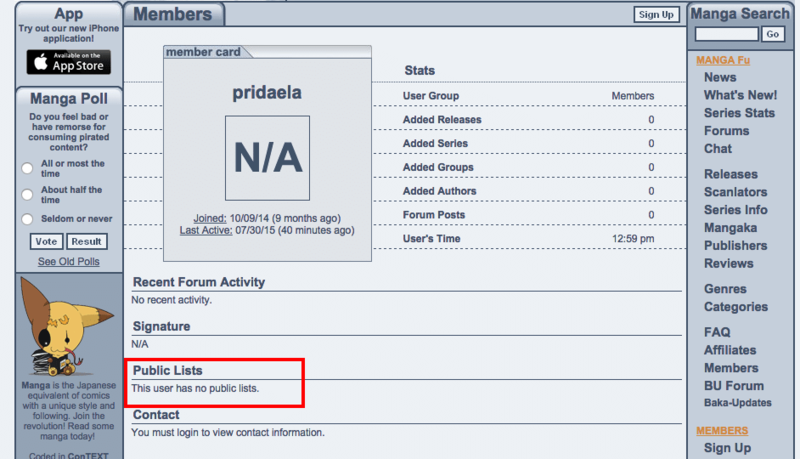 Now try clicking on some favorable reviewer’s names, which will take you to their profile page. Check their public lists section. If they don’t have any lists, too bad, try somebody else. If they do have a public list, great! 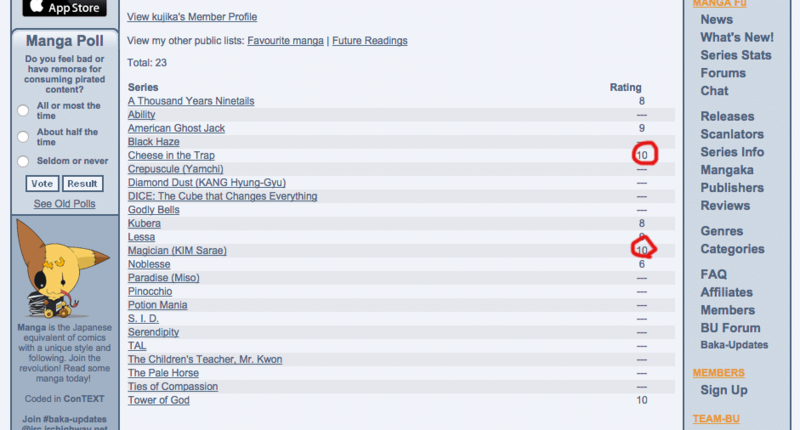 Some users will have “Reading Lists.” Some will have favorite lists. Go into one of these lists and take a look. 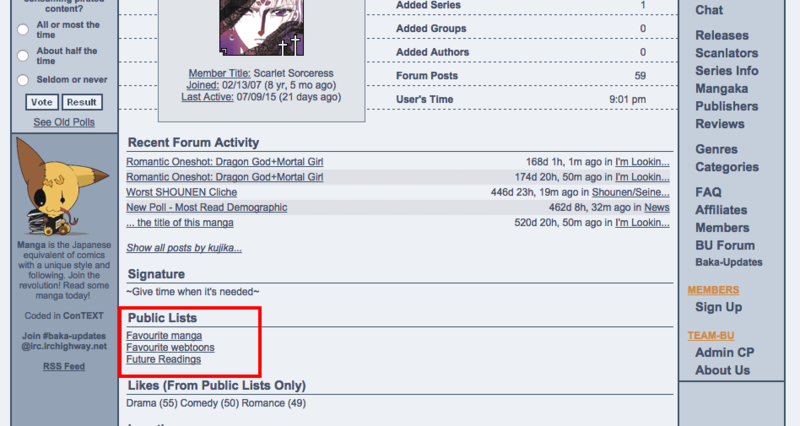 Yay, this person has some lists! Let’s take a look. 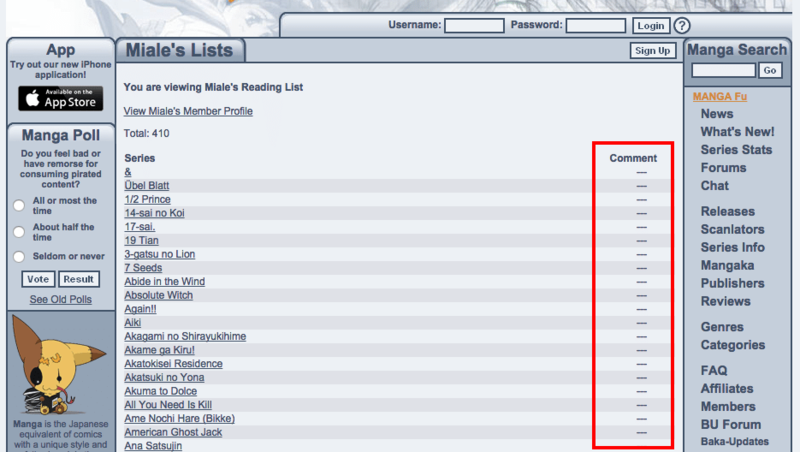 For a Reading List, which typically may or may not have a LOT of manga listed and/or rated, look for ones with higher ratings, between 8-10. Some reviewers don’t rate the series they read; in those cases you can still identify some good series by seeing which ones they’ve reviewed. If there are no ratings but there is a View link under “Comment” for some series, tap into those comments and see whether or not that review was favorable. Also note that if the reviewer has a large list of manga and tends to rate EVERYTHING really high, you might want to try another person. A reading list with no ratings. At times like these, check the Comments section for any comments made. For a Favorites List, you can do the same thing if there are ratings/reviews. However, some reviewers have smaller favorites lists and often don’t bother with rating them. In the case that the list is quite small and there are hardly any ratings/reviews, still check all the series in the list out. If you tap on them you can see the summary and possible reviews by other Baka commenters, as well as its Baka Updates rating. If you’re lucky, by now you’ll have found something new and worth reading! A favorites list that does have some ratings. Check out the highly rated ones first! You can chain this method after you’ve found something nice. 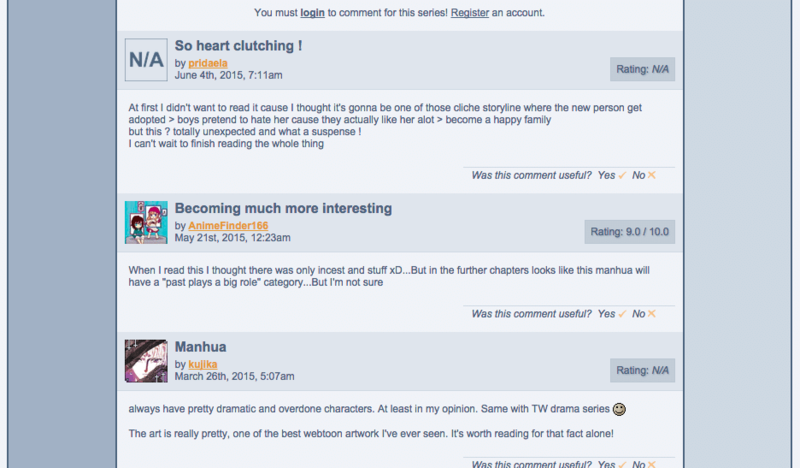 e.g., You search for a series, find some other great series through the reviewers in the comments, and then you can find new reviewers through the comments section of the new series you found. It’s infinite! This is one of my favorite methods and to date, I have discovered some amazing series this way which I probably would never have heard of otherwise. The idea is that reviewers with similar tastes as you will give a review with views similar to yours. And those people are very likely to rate highly other series which you will like. The reason it works better with lesser-known series is twofold: one, if a reviewer has gone to the trouble of putting a comment on a series that is not particularly well-known, chances are he/she reads quite a lot of manga. For popular series like Naruto, many of the reviewers may not really read anything else, or only reads mainstream stuff, so even if you found their lists it may not be the most enlightening. The second reason is that if the reviewer has rated and commented a lesser-known series, there is a higher chance that the reviewer rates and comments on series regularly, as opposed to being a huge fan of something mainstream, making an account just to comment once, and never using it again.